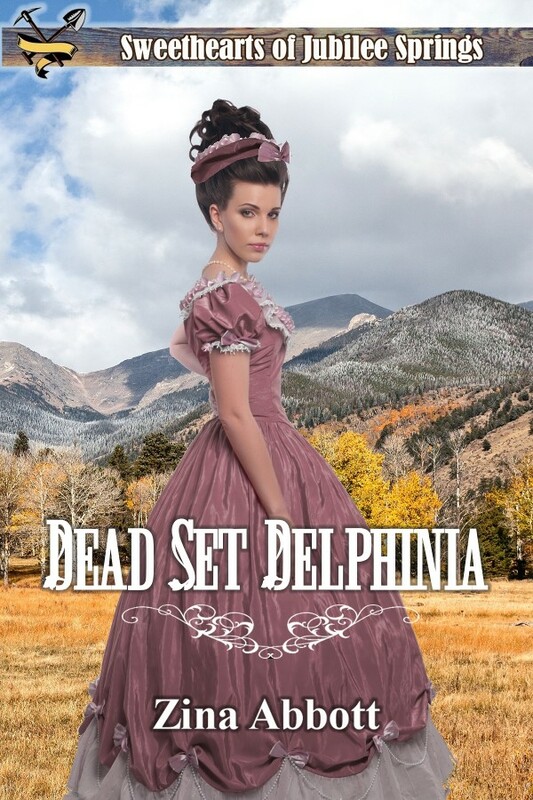 In my most recent novel, Dead Set Delphinia, my heroine in the fall of 1881 finds herself involved with the furniture store owner in the relatively new mining town of Jubilee Springs. Since he has the skills to nail together a pine box, he has also become the coffin-maker and, by default, the town mortician. This was not all that unusual. While researching Lundy, California for the Eastern Sierra Brides 1884 series I wrote, I found in real life the furniture store owner, Andrew Barnes, was also the coffin-builder and mortician for that community. 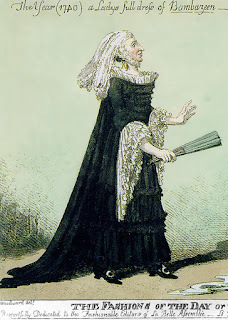 As part of the plot, in Dead Set Delphinia, when Bennett Nighy asks for Delphinia’s help to act as a hostess at the viewing of one of the town’s beloved deceased citizens, she decides it is time to visit the seamstress in order to see if the woman can help her put together an appropriate gown in black bombazine. I sew, and I have been known to frequent fabric stores. 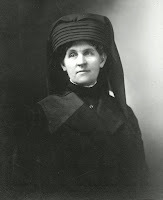 However, my first recollection of being exposed to the fabric bombazine came about as I read The Widow of the South by Robert Hicks. This novel, based on a true story, tells about Carnton Plantation, the scene of a horrific Civil War battle in 1864, how the land became a cemetery for the multitude of Confederate dead. It continued to be watched over by the widow of the plantation owner who, until her death, wore nothing but black bombazine mourning dresses. The word “bombazine” struck me as unusual. The way my crazy mind works, it put me in mind of cabaret music – you know: bomba-bomba-bomba. NOUN: a twilled dress fabric of worsted and silk or cotton. Bombazine, or bombasine, is a fabric originally made of silk or silk and wool, and now also made of cotton and wool or of wool alone. Quality bombazine is made with a silk warp and a worsted weft. It is twilled or corded and used for dress-material. Black bombazine was once used largely for mourning wear, but the material had gone out of fashion by the beginning of the 20th century. In the nineteenth century, the fabric was mostly made in Norwich, England. Bombazine is said to have originated in the United Kingdom in the early 18th century but quickly spread across Europe and eventually called bombazine from the old French word bombasin. 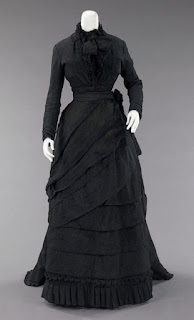 Interestingly enough, it first found use as a cloth ideal for mourning widows although subsequent growth of the fashion industry allowed it to flourish towards other uses. Bombazine was also used to make the black robes worn by judges. • Bombazine used to be exclusively made from silk. However, the subsequent need to make it affordable to the masses necessitated the shift from silk to cotton and wool. In many societies in olden times, the price of silk was too exorbitant to merit buying bombazine. However, because bombazine cannot compete with velvet as a luxury material, it was forced to find another niche in a more affordable price range. 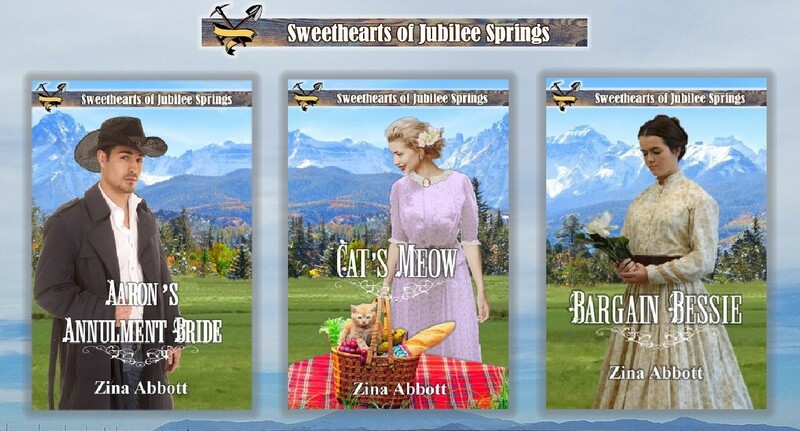 • Twilling or cording are the only known methods known for making bombazine. Twilling is process of weaving where cloth strands are pushed through other cloth strands positioned lengthwise on a weaving machine. The resulting cloth has a characteristic diagonal pattern that is highly resistant to ordinary wear and tear. More modern incarnations of twilled fabric include denim which is used for making jeans. 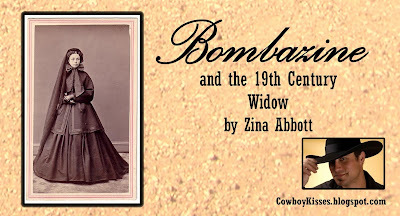 • The use of bombazine as a mourner’s cloth was precipitated by the observation that the fabric has just enough sheen and sparkle for a mourning widow. 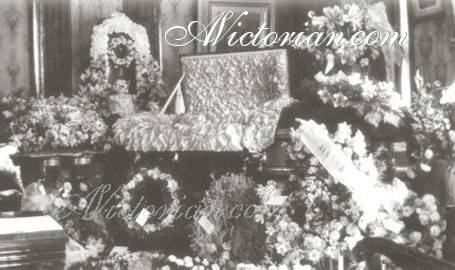 Too much sparkle would have been construed as a blatant display of disrespect to the dead while cloth with less shine would have been a symbol of low status in society which was not ideal in an era where Victorian affluence was the prevailing theme. • While bombazine can be made in a variety of colors, it is predominantly manufactured and sold in black. This is consistent with its status as the cloth of choice for mourner’s dresses. 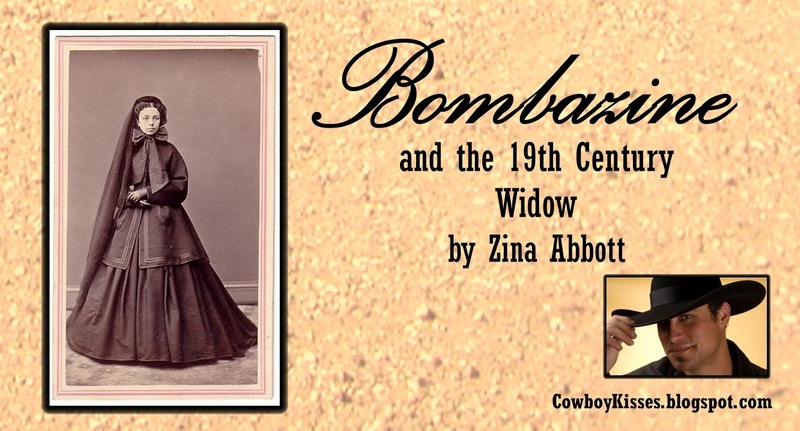 • Today, bombazine no longer has the same status as it once had in Victorian times. Bombazine is still sold in many shops but in substantially lower volumes. The values of the modern times has pushed the material to relative obscurity so much so that not many people are familiar with this type of fabric. • Modern applications of bombazine include lining material in caskets and jewelry boxes. The next time you see a casket, check out the inner lining so you’ll know firsthand what bombazine looks like. Dead Set Delphinia is a full novel and the fourth of Zina Abbott's books in the Sweethearts of Jubilee Springs series. You may read more about it by CLICKING HERE. 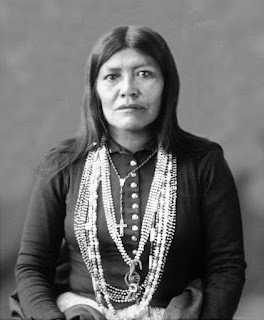 Her fifth book, Evasive Eddie Joe, is scheduled for publication October 31st. Can you believe that next week, November begins? I'm not even ready for Halloween and it seems like this year is running away from me faster than I can catch up. I'm finishing up my last two stories for this year (2017) and as I get ready for next year, I'm already dreaming of places I want to go. You know how they say in real estate its location, location, location, it's the same as a writer. Some stories don't work in some locations. While we have several rodeo schools in North Carolina, it seems odd to set that type of story along the coastal plain. You might instead write a story about wild ponies along the coastal barrier dunes or perhaps talk about hunters and jumpers, show rings and dressage. Small farms and rural towns are on the bill for the mid Atlantic states as well as the mid west. But, what I'd really like to sink my teeth into would be a good lumber camp story. I've been doing some research on Wyoming and that might just be the place. 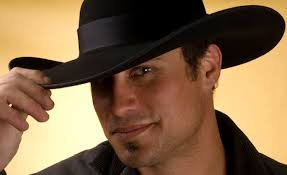 Maybe a dude ranch, where a cowboy falls for a fish out of water? 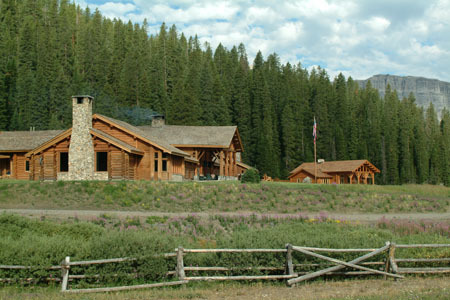 Or a ranch that has to go for the modern approach to save itself from ruin? Lots of good possibilities. What say you? 1) The Return of Dracula, 1958—calling this a western might be stretching it a wee bit but most of the action does take place in California. After killing a fellow train passenger in Transylvania (where else? ), the blood-sucking Count takes the man’s identity, heads to CA, visits the dead man’s family, and begins a killing spree. 2) Billy the Kid vs. Dracula, 1966, starring John Carradine. With a title like that, this hardly needs an explanation. As the poster says, ‘The West’s Deadliest Gunfighter! The World’s Most Diabolical Killer!’ The bloody Count travels west by stagecoach and has toothmarked his next victim. Presumably, Billy hasn’t been shot as yet by Pat Garrett and has some indefinable relationship with one Betty Bentley, whose blood the Count is out to get. Drac pretends to be Betty’s uncle, Underhill. You get the idea . . . .
was a remake in 1986. This was a series of twelve episodes in which the singing cowboy discovered the lost civilization of Mu beneath his Radio Ranch. He attempts to stop war between the Muranians led by a subterranean queen and, well, his listeners—and pals. 4) Riders in the Sky, 1949, another Gene Autry vehicle. Anyone who knows the country/western song ‘Ghost Riders in the Sky’ will immediately get the idea of the main event here. Detective Autry takes one last case to help a lovely lady rancher clear her father’s name when he’s been wrongly accused of murder. Gene goes looking for the three witnesses who can clear the innocent man, and ends up singing the popular song. 5) The Valley of Gwangi, 1969, starring the rather dishy James Franciscus. They don’t come much weirder than this one, folks. Members of a Wild West show head to Mexico’s Forbidden Valley after discovering a 50,000,000 year old midget horse. There they discover dinosaurs still exist and aim to take home an Allosaurus, Gwangi, to lighten up their act. Great scene of the cowboys lassoing the dinosaur. Mesquiteers with an early appearance by renowned stuntman Yakima Canutt. 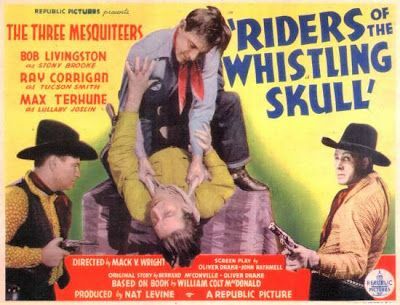 The Three Mesquiteers starred in a series of fifty-one B westerns between 1936 and 1943, including eight with John Wayne, believe it or not. In this episode, the three accompany an archaeological expedition along with a woman on the team whose father has been lost in the Indian village of Lukachukai. As several deaths occur and a member of the team appears in an adorable pajama onesie (worth the one hour viewing alone), it turns out the tribe is under the control of a power-mad white man. 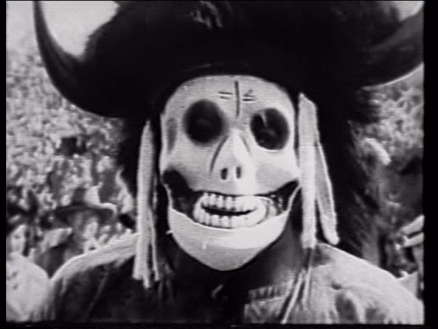 Most of the actors seem to have graduated from the Wooden School of Dramatic Art, the music is strictly left over from silent films and, by my reckoning, it contains the worst Native American dancers in the history of cinema. 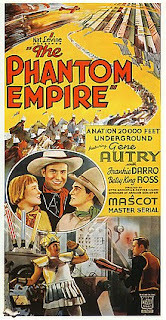 Somewhat hard to swallow is the 1930’s view of Indians but, if you can ignore that, for the fifty-two minutes of watching, it might be worth the laughs. 7) The Hanged Man, 1974, starring great jobbing actor Steve Forrest, and meant as a pilot episode for a series that never took off. With several well-known faces in this, it’s surprising it didn’t make the grade. It has Cameron Mitchell (Buck from The High Chaparral) as a greedy mine-owner after the heroine’s ranch and mine; the perennially old Will Geer, Grandpa from The Waltons, as Nameless, the lady’s ranch hand; and Academy Award winner Dean Jagger as Forrest’s lawyer; plus it was produced by Bing Crosby Productions. The storyline sees Forrest as wrongly convicted gunslinger Devlin who somehow survives his swing on the noose only to sport what looks like a Burberry scarf around his neck to hide the rope marks. 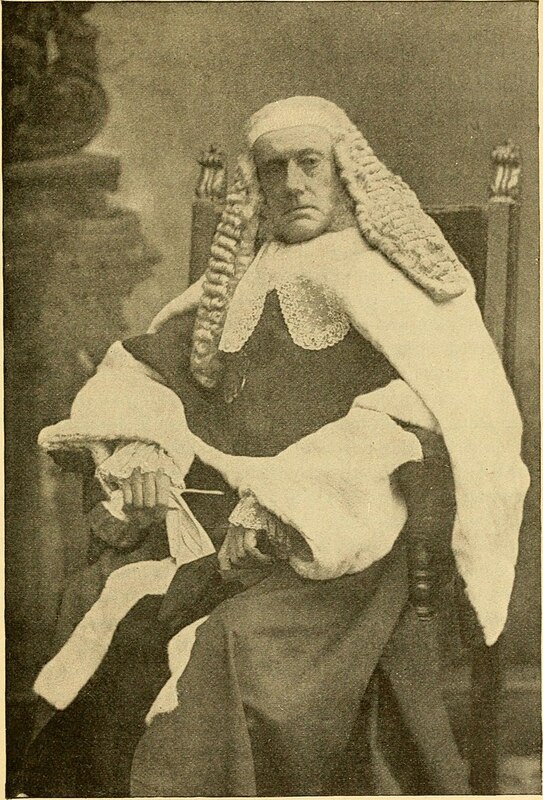 Devlin, now hell-bent on doing good, gets caught up in the dispute between the lady mine-owner and the villain after her mine. Numerous Biblical and Christian references throughout might not have garnered a wider audience with those who prefer their sermons on Sunday. It is, however, well-acted albeit slow moving at times. The ending is straight out of Dante’s Inferno. I haven’t mentioned more recent films because most of you will know about movies such as High Plains Drifter, Westworld, and the aforementioned Cowboys and Aliens. The old films are not only spooky in several senses but good for laughs. However, should film-viewing not be your scare of choice, may I direct you to a duet by Patti Sherry-Crews and myself, and wish you all a very Happy Halloween. 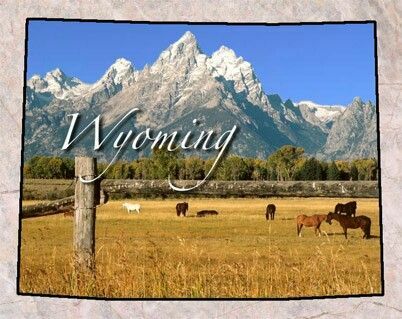 The Wild West gets even wilder when Nat Tremayne sends out his agents from Psychic Specters Investigations offices in St. Louis and Denver. Across country and across time, these agents will stop at nothing to unravel the mysteries that beset poor unsuspecting ranchers and cowboys who have no idea what they're seeing . . .or not, as the case may be. In Patti Sherry-Crews' The Ghost and The Bridegroom, P.S.I. Agent Healy Harrison is sent to Tucson to rid a rancher of the ghost in the bedroom interfering in his marriage to a mail-order bride. Healy doesn't think she's destined for romance--until she meets Pinkerton detective Aaron Turrell. But when their two cases dovetail, will their newfound love survive the ultimate showdown between mortal and immortal. 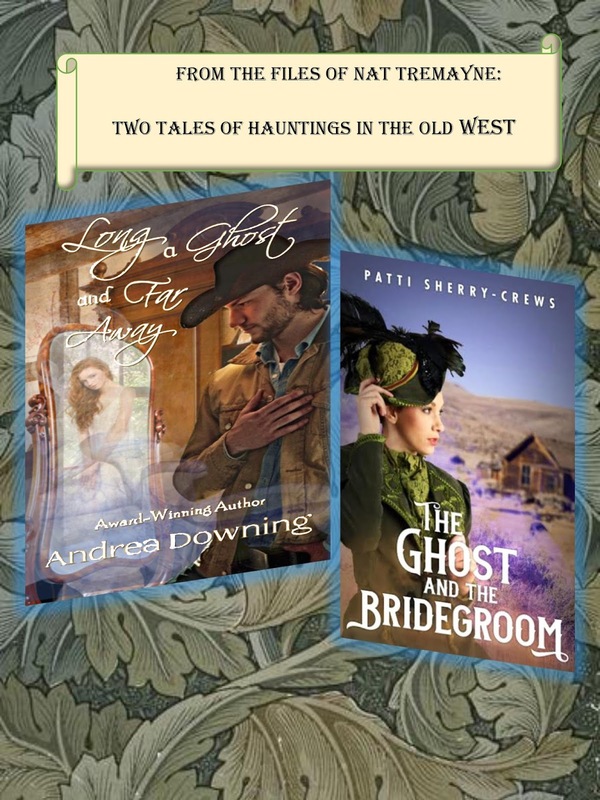 In Andrea Downing's Long A Ghost and Far Away, agent Dudley Worksop aims to unravel the mystery of Colby Gates' dead wife. 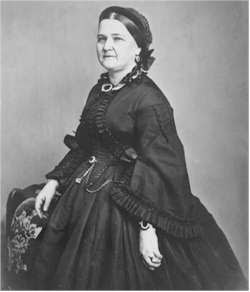 Lizzie not only seems to have reappeared as a ghost, but has time traveled from 2016 to the 1800s. Can revenge be had for her murder? And can the couple be reunited across country and across time? Bone Chilling, Rib Tickling Campfire Stories!